Recent technological developments are likely to lead to strong growth and adoption of commercial robots in the coming decades. Robots have made incredible advances in recent years thanks to improvements in computer vision, dexterity and overall economics. But most of the growth has happened in industrial applications, and thus hidden from the public eye. However, due to recent breakthroughs in the fields of AI, mechatronics, sensors, and batteries, there are strong reasons to believe that we will see strong growth in the commercial robots segment. 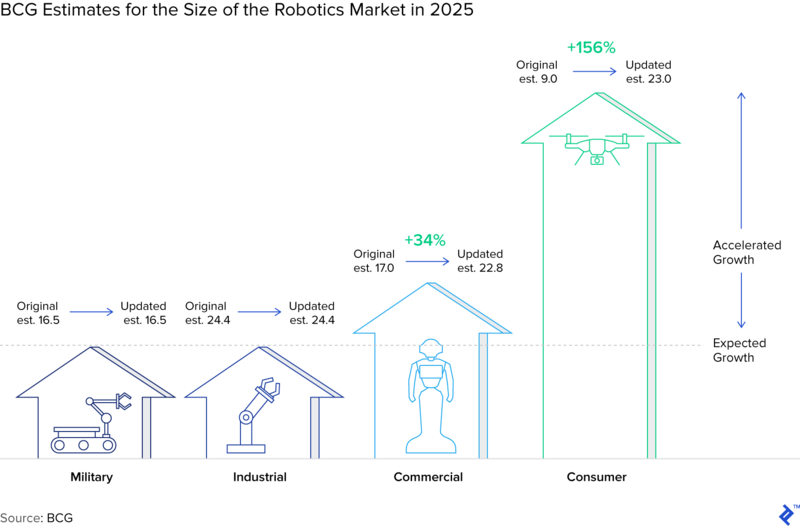 Estimates for the potential size of the industry vary, but commercial and consumer robots are likely to reach market sizes of $20-30 billion over the coming decades. The most relevant drivers supporting this likely growth spurt are technological drivers, market drivers, productivity drivers, and safety drivers. Improvements in AI and sensors technologies will enable robots to learn and adapt, widening their possible applications. Growth in food demand and eCommerce will have a major role in supporting production and other supply-side applications for autonomous guided vehicles and drones. The need for higher productivity to support GDP growth will also drive the industry forward. Robots will, in most cases, augment human potential, increasing overall productivity and driving economic growth. Safety drivers will also mean that robots will increasingly take over from humans in those jobs and tasks where human safety is at risk. The commercial applications likely to see the most growth are autonomous guided vehicles, drones, medical robots, and field robots. AGVs are the largest and most promising commercial application, and the market is expected to reach $10 billion by 2025. Propelling the market forward are advances in autonomous driving technology. Drones will revolutionize business operations in 3D mapping activities, last mile delivery, medical deliveries, inspection activities, transmission of data, video collection, residential insurance, or construction monitoring. The potential for robots in the healthcare space, especially if combined with AI, is enormous. The most interesting applications are related to surgical robots, rehabilitation robots, and medical transportation robots. AI and robotics are also taking hold in the agricultural industry, and currently, the main applications are in harvesting and picking, weed control, autonomous seeding, spraying, and thinning. Readers from a more “mature” generation who grew up watching cartoons may remember the show The Jetsons, in which a family of four, plus their dog Astro, goes about their daily lives in Orbit City in the year 2062, moving around in flying cars that upon the click of a button fold into a small hand-transportable briefcase. Among them is Rosie, the Jetson’s humanoid household robot who is the maid and housekeeper. Rosie performs all the menial tasks in the house and is frequently seen rolling around on her wheel-legs with a vacuum cleaner in her hand. Rosie is just one of a long list of robotic characters that have appeared in pop culture over the decades. Humans have consistently played with and explored the idea of a future in which robots become normal parts of our lives, often taking over the more menial tasks and chores. Nevertheless, such a future has so far failed to materialize, perhaps the closest thing we have so far being the Roomba robot vacuum. In reality, robots have made incredible advances in recent years. Thanks to improvements in computer vision, dexterity and also overall economics, robotics applications have become increasingly useful and more convenient for a variety of repetitive and heavy tasks. But most of the growth in robotics has happened in industrial applications, and thus hidden from the view of the general public. But thanks to recent breakthroughs in the fields of AI, mechatronics, sensors, and batteries, there are strong reasons to believe that this is likely to change. The focus of this article will, therefore, be on the prospects for so-called service robots, i.e. the more consumer and commercially oriented robot market. This is arguably the most interesting area of development going forward, where autonomous learning and modular platforms are producing the most relevant impacts. A future where Rosie the robot vacuums the house and cooks our food for us is perhaps no longer such a distant mirage. Firstly, some clarificatory definitions are in order. And perhaps the best place to start is with the more fundamental and general question of what a robot itself is. Identifying a common definition is challenging: if you ask three different roboticists, you’ll probably get a range of different answers. The Oxford Dictionary defines a robot as “a machine capable of carrying out a complex series of actions automatically, especially one programmable by a computer.” But using a standard definition such as this one can often be unsatisfactory, since it could, in theory, imply that many, standard, everyday machines could be considered robots. For example, a dishwasher, or an ATM machine, are machines that are given programmable orders and then execute a series of actions automatically. But are they really robots? A more appropriate definition, in my view, comes from roboticist Anca Dragan of UC Berkeley, who defines robots as “a physically embodied artificially intelligent agent that can take actions that have effects on the physical world.” Put simply, a robot is a machine that gathers information from its surroundings, processes it, and then performs an action based on this information. Using the above definition, there are still many different types of robots, all with different appearances and functions. But what ties them together is that they share a set of common elements like a control system, a battery, end effectors, sensors, actuators, and some degree of intelligence to understand and adapt their actions to the surroundings. Examples of modern robots are collaborative robots, that work together with humans in a shared workspace, and that are able to perceive the humans around them and adapt their movements accordingly. Other modern robots are designed to work autonomously like Autonomous Guided Vehicles (AGV), which are able to drive around a warehouse transporting things, or drones that can perform complex O&M activities or are used for last mile deliveries. These newer generations of robots are fascinating and exciting machines that are destined to change our way of living in countless ways. The International Federation of Robotics categorizes today’s robots into two major categories: industrial and service robots. This division is important and useful because it distinguishes robots based on their relationship with people and work. An industrial robot is the classic robot that we think of as present in a factory, which readers will likely picture with a robotic arm(s) that performs a predefined task. Industrial robots are growing steadily in usage and adoption (see figure below), and this is an exciting and fast-growing market. 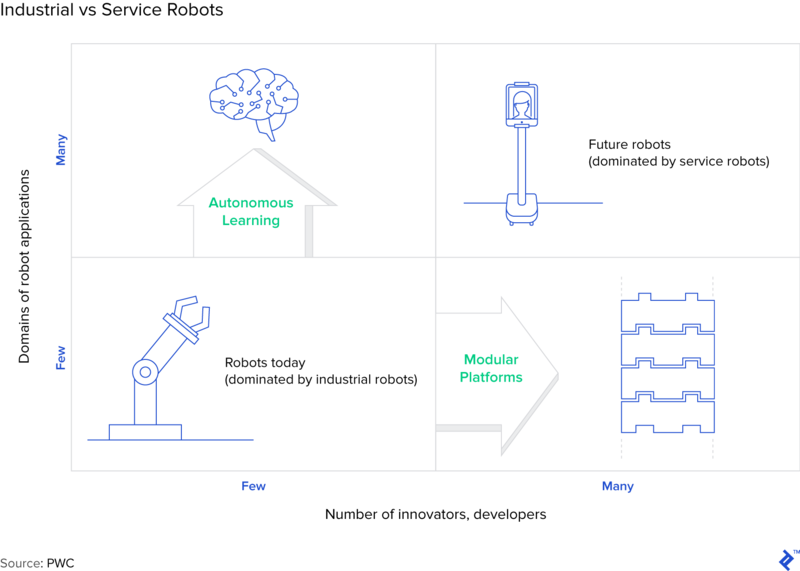 Service robots, on the other hand, extend beyond the workplace and enter a world of exciting new applications that can help improve both our daily life as well as our work life. A service robot “is a robot that performs useful tasks for humans or equipment excluding industrial automation application” (ISO standard IFR). They are classified by their personal or professional use and they take on a range of different forms and have varied and evolving applications. Service robots are developing thanks to relevant advances in robotics related to cognition, manipulation, and interaction, and in my opinion are the most interesting area of development going forward, where autonomous learning and modular platforms are producing the most relevant results and impact. As mentioned, there are a variety of drivers that are supporting the development, and future growth prospects, of service robots. The most relevant are: technological drivers, market drivers, productivity drivers, and safety drivers. Safety drivers: Another factor likely to drive the industry forward is that there are still plenty of dangerous jobs, many of which can already be done by robots. Experts say that robots will take over the dull, the dirty, and dangerous jobs for humans. Estimates vary regarding the commercial robot market’s potential size. In a 2014 report, BCG estimated that the global market for robotics (i.e. including industrial robots) would hit $67 billion by 2025. 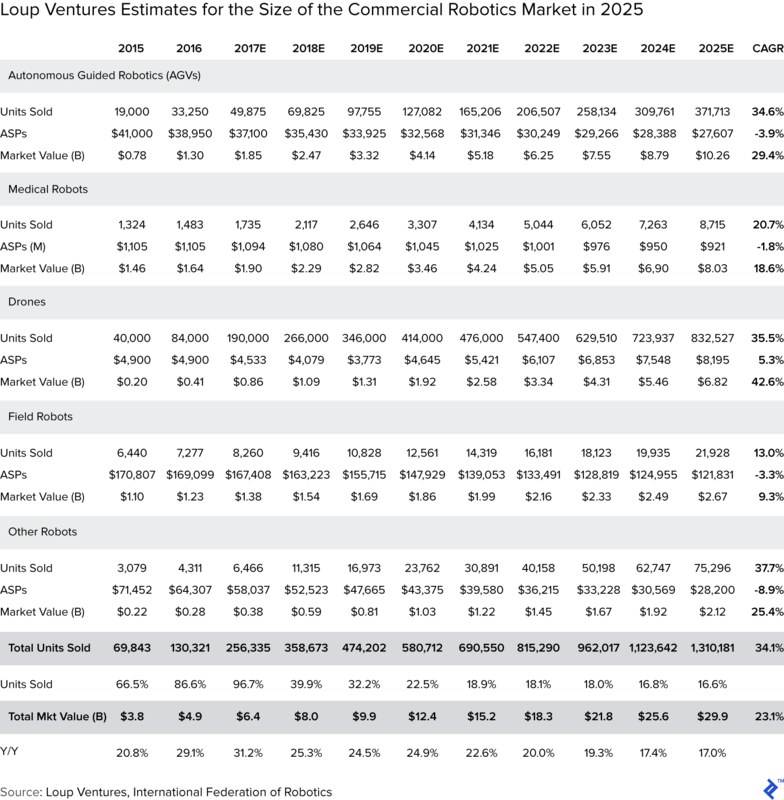 Interestingly, just three years later they revised their estimate upward to $87 billion, driven precisely by a large increase in their estimate for the size of the commercial and consumer market (the estimates were revised upward by 34% and 156% respectively). As can be seen in the figure below, BCGs estimates that both the commercial and the consumer markets will be worth $23 billion each in 2025, for which they had to increase the estimate by the 156% and 34%. 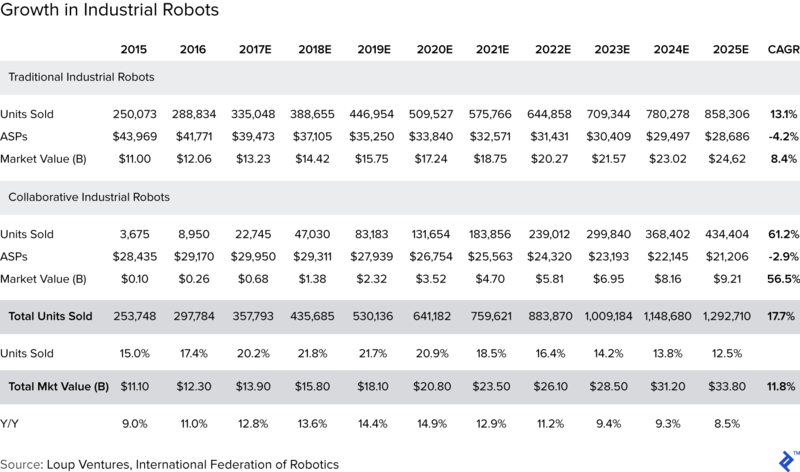 A separate study by Loup Ventures in collaboration with IFR found that the market for commercial robots in 2017 stands at $6.4 billion with 256,335 units sold. They forecast a total of 1,310,181 total units sold for a total of $29.9 billion in 2025 (23% CAGR) – not so far off from the BCG estimate. What stands out from their estimates seen below is that most of the value growth will be driven by the AGV segment, while Drones will have the highest CAGR during the same period. Many additional estimates have been performed, with outcomes that often diverge considerably from the figures shown above, but all share a common trait: they all project significant growth over the coming future. How Will Commercial Robots Be Used? Today, there are already several different applications for service robots. Considering that service robots cover everything outside of manufacturing/industrial applications, this can include areas such as warehousing, healthcare, agriculture, security, and many others. The LoweBot, for instance, is a robot rolled out by retailer Lowe’s in its Bay area stores which “is able to find products in multiple languages and effectively navigate the store. As LoweBot helps customers with simple questions, it enables employees to spend more time offering their expertise and specialty knowledge to customers. Furthermore, LoweBot is able to assist with inventory monitoring in real-time, which helps detect patterns that might guide future business decisions.” Other examples include Savioke in the hospitality space or Locus Robotics in material handling in warehouses. Looking ahead, there are numerous emerging service robot applications, but the segments in which most of the growth is expected is in AGV, drones, medical robots, and field robots. Let’s look at these in turn. Early AGVs were mainly wired (meaning connected to the surface) and for this reason were relatively inflexible and also expensive to install. 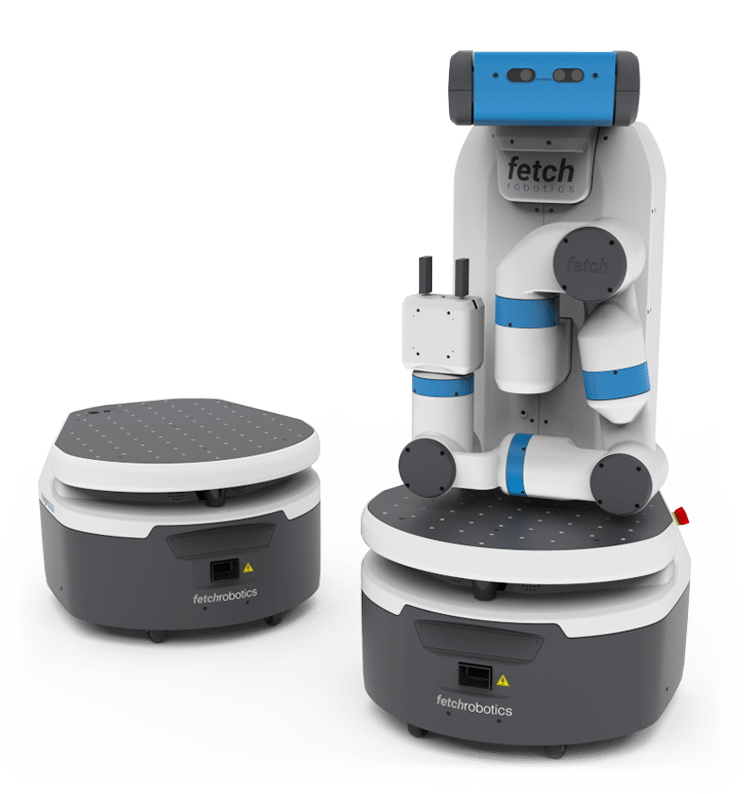 Recently, however, more flexible and intelligent AGVs have been introduced by companies like Fetch Robotics, which are able to take decisions in situations they have never encountered before. This flexibility can produce different benefits, including the possibilities of reduced accidents, higher productivity, and lower costs. Amazon is one of the companies that has made the most use of AGVs inside their warehouses, thanks to their acquisition of KIVA in 2012. Looking ahead, new AGV applications are continuously emerging like the shelf -scanning performed by Bossa Nova Robotics. UGV (unmanned ground vehicles) also are moving over from being mainly military applications to commercial ones. 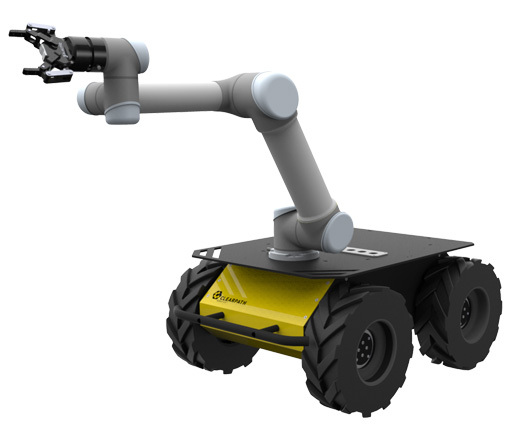 Clearpath Robotics is one of the leading companies in this field, developing both AGVs and UGVs. Drones are revolutionizing business operations in many different ways. Drones can be used in 3D mapping activities, last mile delivery, medical deliveries, inspection activities, transmission of data, video collection, residential insurance or construction monitoring. The impact of drones in commercial activities has been, until now, still fairly limited, particularly considering the estimates of where the market is headed (PWC estimates that the market will be worth $127 billion). This is for a variety of reasons, but principally because of regulatory issues. Most of the value generated by drones in coming years will be related to value adding service activities like data collection, management, and analysis. When autonomous drones will expand their presence into commercial operations, drones will create insights based on harvested data and automatically translate them into decisions and actions. Again, Amazon is one of the companies that is betting the most on drones, via a project called Amazon Prime Air. 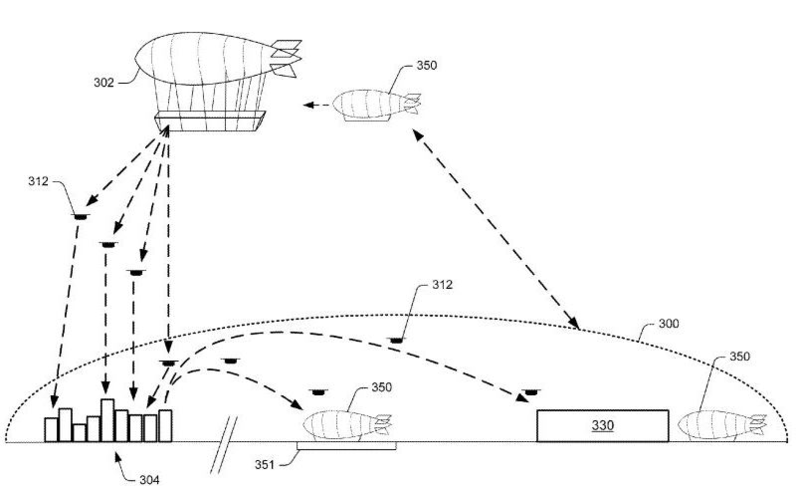 Amazon has developed different patents related to drones, one portraying a multi-level fulfillment center, an airborne drone warehouse 45,000 feet in the air, an underwater drone warehouse, and a drone charging station. Surgical Robots have already enhanced minimally-invasive surgery, reducing patient trauma. Due to improvements in dexterity and computer vision, a robot can now outperform an expert surgeon in the same procedure. Rehabilitation robots, or exoskeletons, are playing a major role in improving the quality of life of those with disabilities, helping improve mobility, coordination, and strength. Medical transportation robots are able to navigate through the hospital facility bringing supplies, medications, and meals, and optimizing the communication between doctors, staff members, and patients. Other relevant applications are sanitation and disinfection robots that can reduce the possibility of infection and the chance of outbreaks of deadly antibiotic-resistant bacteria, whilst robotic prescription dispensing systems can reduce mistakes in the distribution of drugs to patients. AI and Robotics are also taking hold in the agricultural industry, where several startups (e.g. Abundant Robotics or Harvest Automation), are gaining momentum. VCs are putting significant amounts of capital to work in this space, with more than $320m invested in 2017. Currently, the main robotics applications are in harvesting and picking, weed control, autonomous seeding, spraying and thinning. Harvesting and picking are currently probably the most diffused applications in field robotics, where robots are used in greenhouses, but also to collect fruit and vegetables. Weed control is also expanding, which is offering the opportunity to reduce the use of pesticides in farms, with solutions like the one from Ecorobotix. Advances in computer vision are also leading to the development of autonomous seeding, spraying and thinning, whilst other interesting developments are happening in the food industry more broadly, where robots have been applied inside restaurants like Miso Robotics, or for food delivery like Starship. As has hopefully come across by now, it is likely that over the coming decades, robots will play increasingly important roles in our daily lives. Most of the advances will be related to the further development of AI, computer vision, sensors, navigation and semiconductor technology. But whilst the future looks bright, there are a few clouds on the horizon. One of the biggest threats to the development of the sector no doubt comes in the form of regulatory risk. As many readers may already be aware of, there has been an increased amount of debate surrounding robotics and AI, with a particular emphasis on the effects that robots will have on our labor force. My personal point of view on the topic is that robots increase the productivity and competitiveness of the companies adopting it. This increase in productivity can and should lead to an increase in average salaries, which should increase demand, actually creating new job opportunities. The main impact, as has been shown by different studies by Graetz and Michaels (London School of Economics) or by Bessem (Boston University School of Law), of the adoption of robots and automation is a shift from low/mid-level skilled labor, to higher-skilled labor, thus also driving an increase in overall salaries. In this way, robotics can be seen as a way to eliminate or reduce the more menial and dangerous jobs in our economies, and allow for a shift towards more creative and intellectual activities. The main issue though is that the shift toward higher-skilled work will of course not be automatic and will require efforts related to education and re-qualification of certain kinds of jobs, as outlined in a 2017 Mckinsey report. This re-educational effort has to be led by governments as well as by the companies driving the technological revolution, and this is the most important action that must be undertaken if the impending robotics revolution is to be a success. Despite the concerns about automation and robotics’ effects on jobs, the current and foreseeable reality is that there is in fact a clear skills gap, and that many companies are unable to fill vacancies due to the lack of the qualified candidates for these positions related to future robotic technology. The European Commission, for example, predicted that Europe could face a shortage of up to 750 thousand skilled ICT workers by 2020, putting the development of digital skills at the core of their strategy for the EU labor market. In the US it has been predicted that closing the skills gap in robotics and AI could fill an estimated 1 million new jobs, but only if large-scale public and private initiatives connect workers with the training they require. Closing the skills gap will necessitate closer linkages between companies and educational institutions in order to identify and equip workers for these new, more highly-demanded jobs, and better guide students on which courses have the most potential for their careers. To this end, the World Economic Forum launched an initiative aimed at sustaining the activities developed by companies and educational institutions to re-skill and up-skill the workforce for the economies of tomorrow, including in fields such as robotics and automation. Investments in robotics should be sustained by investments in human capital to curb the current skills gap, and allow companies to benefit from a greater level of interaction and complementarity between humans and machines, thus helping to drive economic growth and productivity improvements. How are service robots used? A service robot “is a robot that performs useful tasks for humans or equipment excluding industrial automation application” (ISO standard IFR). They are classified by their personal or professional use and they take on a range of different forms and have varied and evolving applications. 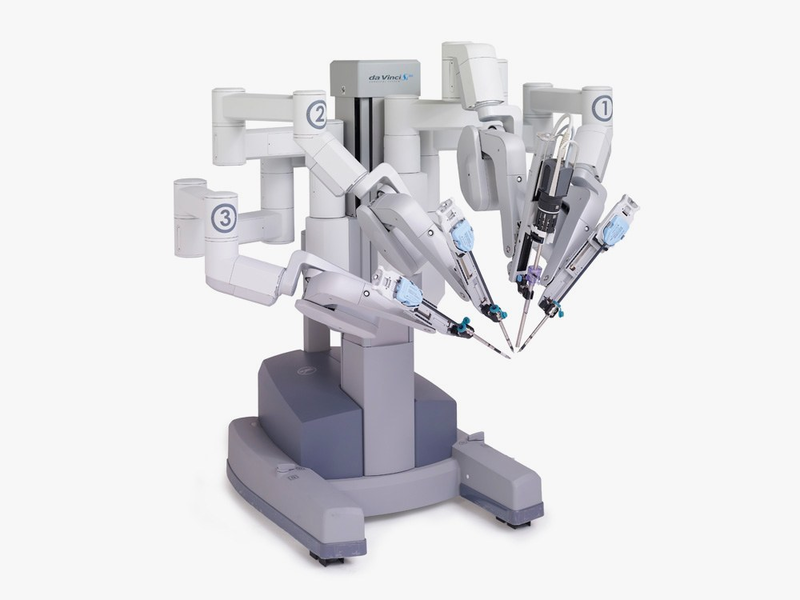 Surgical Robots have already enhanced minimally-invasive surgery, reducing patient trauma. Due to improvements in dexterity and computer vision, a robot can now outperform an expert surgeon in the same procedure. What are some jobs that robots do? Examples are collaborative robots that work together with humans in a shared workspace and are able to adapt their movements accordingly. Autonomous Guided Vehicles (AGV) are able to drive around a warehouse transporting things, and drones can perform complex O&M activities or are used for last mile deliveries.